You may not have known it, wise, experienced, seasoned Tutor, but I was a first year Tutor attending Tutor Training last year. I had only signed up for Classical Conversations two weeks prior, and found myself in the role of Tutor as well. Most of my memories from year #1 Tutor Training consisted of feelings of panic, asking myself, “What am I doing?”, and resisting the urge to breathe into a brown paper sack due to hyperventilation. However, wise, experienced, seasoned Tutor, you made one suggestion that stuck in my over-stimulated, drinking-from-a-fire-hydrant-information-overloaded brain—sleeping bags for Tin Whistles. You suggested that we make these for the children in our class to help prevent random, impulsive, impromptu Tin Whistle concerts. I yielded to your wisdom and made 8 sleeping bags for my Abecedarians last year, and the words that you spoke were truth. These handmade, vintage, biodegradable, construction paper-based sleeping bags did exactly as you said. They aided my Abecedarians in resisting the urge to perform symphonic sonatas and harmonious melodic tunes until the appropriate time in class. P.S. I don’t remember your mentioning, Wise, Seasoned, Experienced Tutor, that parents should label their children’s Tin Whistles with a Sharpie. I am sure that was an oversight on your part. I know that preventing the spread of germs, strep throat and various and sundry fall and winter illnesses would be of utmost concern for you. Again, my utmost thanks for your inspiration. 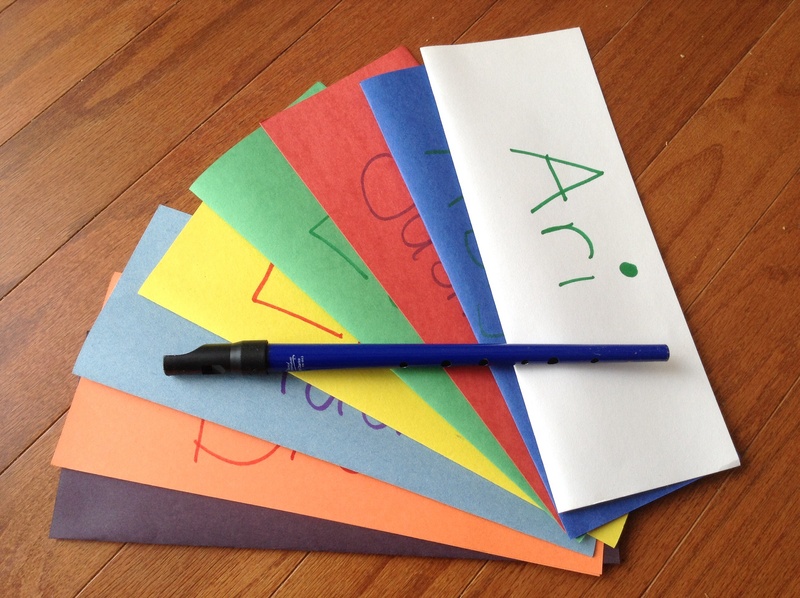 DIY Tin Whistle sleeping bag–Fold one sheet of construction paper “hot dog” style. Apply glue on the long side (opposite the fold) and on one of the short sides. Press together. Leave the other short side unglued in order to insert the Tin Whistle for his nap time. Add your child’s name and reuse for 6 weeks. ← What do Constellations & Curious George have in common? YAY! so glad you’re making them for your class! they will love them!!! 🙂 🙂 i’m shakin’ in my shoes if you’re calling me a wise, experienced, tutor! how’s tutoring going for you?!?!? YAY! I’m so glad to know these are helpful!!! 🙂 Thanks for commenting!! I’m going to make these for my 8 Apprentices for class on Wednesday. I know we’ll need them!! Thanks!